Mr. Myers has now apologised. See below. DUBLIN — The Sunday Times of London has pulled from its website an op-ed article denouncing the campaign by women of the British Broadcasting Corporation for equal pay after the column sparked widespread accusations that it was anti-Semitic and misogynistic. suggested stars Claudia Winkleman and Vanessa Feltz earned more money at the BBC because they were Jewish. Editor Martin Ivens said he has apologised personally to Ms Feltz and Ms Winkleman for these "unacceptable comments both to Jewish people and to women in the workplace". 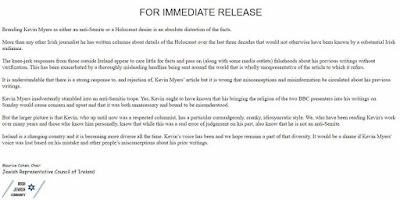 He added: "It has been taken down and we sincerely apologise, both for the remarks and the error of judgment that led to publication." But, there is a more insidious racism at work in the UK as reflected in Myers' writing: even in the most well lettered circles, anti-Semitism is unquestioned and tacitly accepted. I have on more than one occasion nonchalantly been reminded that it makes sense that I’m a journalist because, you know, “the Jews run the media”. 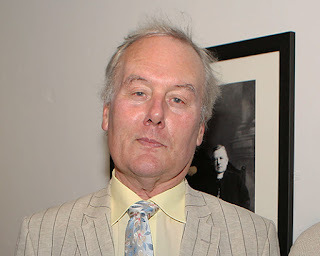 It is often accompanied by a smirk and insistence that the individual is not anti-Semitic...There are real-life consequences of these comments; so many Jews I have spoken to are fearful to be open about their cultural and religious heritage because of the inevitable fear of anti-Semitic bigotry and, occasionally, violence. Too bad for the Irish. And yes, he has defended Israel. But employing such an anti-Semitic trope destroys any value that support has. ...he is being semantic and pedantic. 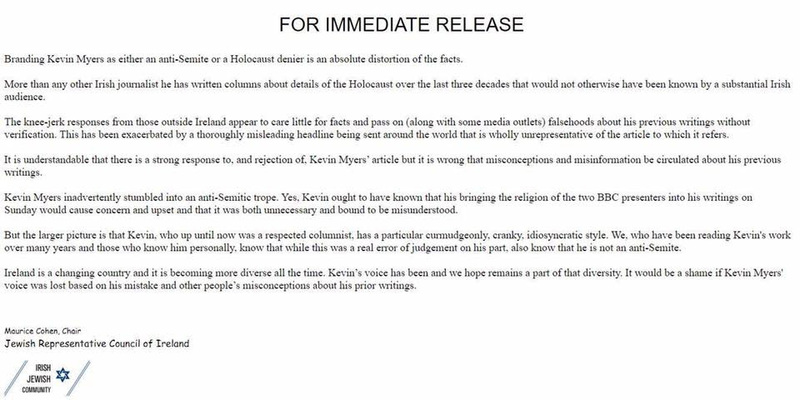 He “denies” there was a holocaust because in Greek it means burning. He denies there were six million victims because (a) he doesn’t seem to understand the concept of approximation, and (b) his logic is defective (i.e. he think that if you kill, say, 6.1 million people then you haven’t killed 6 million). It’s an idiotic way of trying to say that people like David Irvine, however vile, should be allowed so say what they like. "I am very, very sorry that I should have so offended them and I do utter an apology, not for any reason other than out of genuine contrition for the hurt I caused them but I uttered those words out of respect for the religion from which they come. And for the religion that I still hold in high regard, particularly the Irish members of that religion who have been so forthright in their defence of me generally." They broke the only rule that matters – don’t pick on people who can answer back. Jewish people have learned from the most abysmal experiences to be alert to the tropes of anti-Semitism and to call them out when they see them. It’s a matter of survival. Myers was probably half asleep and wholly bored when he threw in some of those tropes to try to enliven the corpse of a moribund column. He woke up out in the cold he has so long pretended to enjoy inhabiting. The Israel government reacted to Wednesday’s reading of the Koran and Muslim prayer on the Temple Mount in Jerusalem in a new mosque constructed at the former Barclay Gate next the current Mugrahbi Gate. On Wednesday, there was a regular call to prayer, and the call to prayer was attended by the President of Religious Affairs in the Palestinian Authority and was broadcast by Authority's television. 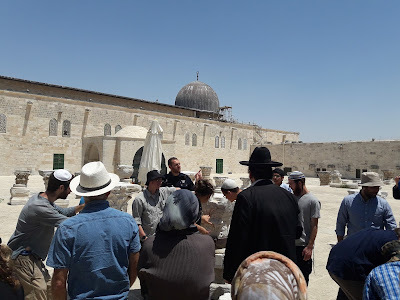 In a statement, Israel’s Foreign Ministry stressed that the Temple Mount is a UNESCO World Heritage Site and therefore an attempt to alter the status quo bu creating a new mosque is an insult to the international community. The ministry notified UNESCO of the issue and Deputy Foreign Minister Tzippy Hotobely met with a high UNESCO official today (Thursday). 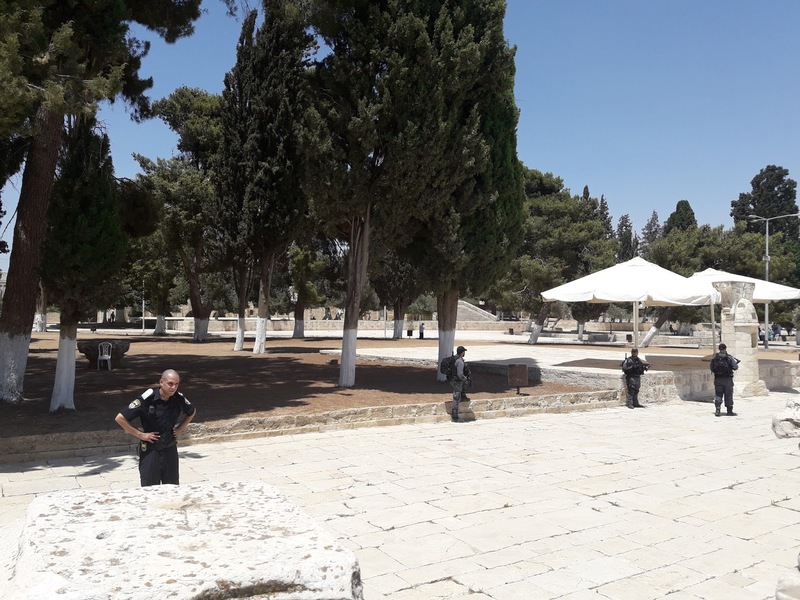 “We call upon the Palestinian Authority to show the attitude of a modern and democratic country and to protect the universal character of the Temple Mount, respecting the long-standing tradition of this universal monument,” the Foreign Ministry’s announcement concluded. The Greek government reacted to Wednesday’s reading of the Koran and Muslim prayer in Hagia Sophia in Istanbul, despite the strictly secular museum character of the monument. On Wednesday, there was a regular call to prayer, as is the case in all mosques, with the only difference being that the gates did not open for the faithful to enter. However, the call to prayer was attended by the President of Religious Affairs Mehmet Gormez and broadcast by state television TRT-Diyanet. In a statement, Greece’s Foreign Ministry stressed that Hagia Sophia is a UNESCO World Heritage Site and therefore an attempt to turn it into a mosque is an insult to the international community. The ministry notified UNESCO of the issue and Deputy Foreign Minister Yiannis Amanatidis met with a high UNESCO official today (Thursday). “We call upon Turkey to show the attitude of a modern and democratic country and to protect the universal character of Hagia Sophia, respecting the long-standing tradition of this universal monument,” the Foreign Ministry’s announcement concluded. You weren't really fooled, were you? 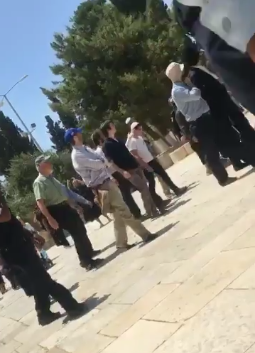 From Spokesperson Heather Nauert's State Department Press Briefing on July 25, 2017 we learn that the US Administration was pressured about its response and possible involvement with the Temple Mount security issues last week. QUESTION: -- and that has to do with the metal detectors and their replacement. 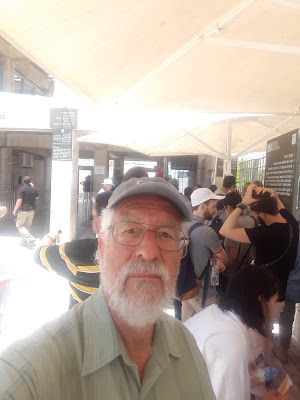 QUESTION: So did you guys think that it was a – or do you think that it is a good idea for the Israelis to remove the metal detectors? MS NAUERT: I think – and I’m going to repeat this again – anything that serves to de-escalate tensions and pave the road for the two sides to come together and have conversations not only about this, but also about the peace process moving forward, we would certainly support that. As you know, we support the maintenance of the status quo at that site and we welcome all sides and their commitment to the status quo. QUESTION: Well, right. So the Israelis say that they’re going to take the metal detectors away but replace them with these --QUESTION: Cameras. QUESTION: -- high-tech, high-definition, high-resolution cameras. This is something that I spent hours with your predecessor, because the previous secretary of state got an agreement between the Jordanians and the Israelis for cameras similar to this that never were put in place because the Palestinians objected. Did anyone discuss their refusal to permit the cameras? Was it criticized? And was it the Palestinian Authority or actually the Waqf? Why didn't Jordan, who funds the Waqf, force the issue? Do you think that this new arrangement with cameras is a step in the right direction and does it change the status quo? MS NAUERT: I think that we would leave it to those parties to determine what works for them. Ultimately – and as it goes with the peace process, ultimately, it’s their decision to make. Both parties have to be able to live with it and be able to work with it. We are merely here as a supporter, a facilitator of peace, and that’s not going to change, but they have to be able to work together. QUESTION: So this isn’t something that you would advocate? 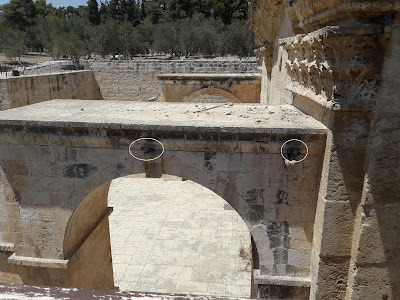 You would not – this administration would not say to the Jordanians, the Palestinians, and the Israelis, look, we think that these high-tech cameras are the way to go? MS NAUERT: I’m not aware of that conversation taking place. What I do know is that tensions seem to be lessening a little bit. We’re pleased with that. It looks like it’s going in the right direction right now. Obviously, a very fragile region, so I don’t want to add to anything there that could potentially heighten concern. We’re happy that Mr. Greenblatt’s there, and let me just leave that at that. Okay? If the US won't get involved in any easy minor issue like cameras to assure security, what about the really more important and critical issues? Al-Jazeera? Why Not Ban Haaretz? 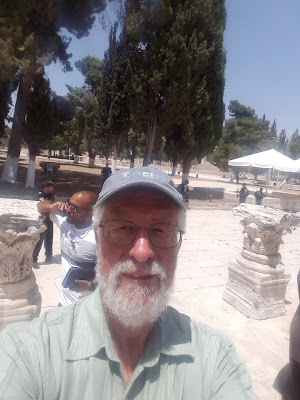 Or, To Whom Belongs the Temple Mount? No, I do not support banning newspapers. Of course, it would be great if Haaretz would be more inclusive in representing various Israeli voices (it's English blogger section is all hard-line left). And if it would voluntarily cease employing Nazi-themed vocabulary by Rogel Alpher, Gideon Levy, etc. And if it would publish op-eds a little bit more reasoned. 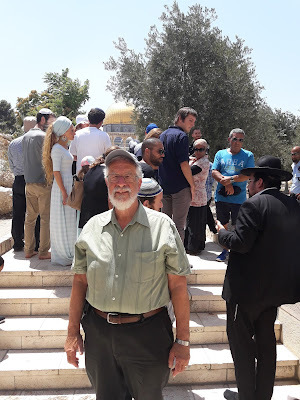 The Temple Mount "belongs" to the Muslims? Why? Why does it "belong"? Because Muslims conquered Jerusalem in 638 and then occupied it? Because Jews were finally banned from the compound in the late 13th century (1266) after maintaining a presence therein, including a synagogue, even after losing political independence? Because Muslims believe Abraham was really a Muslim and constructed there a mosque? Because the Waqf officials and also Palestinian Authority officials believe Solomon' Temple never existed? Because they belief Mohammed landed at the site on Al-Buraq, his winged horse? Because they believe Jewish feet defile the area? Because despite their Quran does not mention Jerusalem in that night's magic flight, they insist the "farthest mosque" means Jerusalem and not the other mosque near Medina? Or because Muslims are willing to kill, murder, stab, run-over, bomb, shoot or otherwise threaten violence? In 1950, after the fighting between the Arab States and Israel had been brought to an end, King Abdullah formally incorporated within his kingdom that part of Palestine which bordered on Jordan and which was still occupied by his troops. Amman, July 24 (Petra) -- His Majesty King Abdullah II, on Monday evening, discussed with Israeli Prime Minister, Benjamin Netanyahu, the crisis in the Al-Aqsa Mosque/Al-Haram al-Sharif. During a phone call, His Majesty stressed the need to find an immediate solution and remove the causes of the ongoing crisis in the Al-Haram Al-Sharif, to restore the situation to what it was before the outbreak of the crisis and full reopen the Al-Aqsa Mosque. King Abdullah also emphasized the necessity of removing measures adopted by the Israeli side since the outbreak of the crisis and the importance of agreeing on measures to prevent the reoccurrence of such escalation in the future, in a manner that ensures respect for the historical and legal status in Al-Haram al-Sharif. The metal detectors are to be removed, so they are the causes. So, the "status quo" once again is sanctified. The detectors have now detected Israel's government's weakness. The detectors are the "provocation". Jordan must be involved in any agreement (and even if it couldn't carry through the previous agreement to affix surveillance cameras two years ago that could, perhaps, have prevented the terror attack of a fortnight away). The detectors "escalated" the tension. And so appropriate for this pre-Tisha B'Av period. Fatah:"With our blood we will thwart the Zionists' plans#No_to_the_cameras"
The Waqf religious trust announced Tuesday its position on the Israeli security cabinet decision to remove metal detectors from the Temple Mount is "to reject outright any changes, including technological measures." The Waqf also said that "the gates of the mosque should be opened to Muslim worshippers in a completely free manner and to ensure freedom of worship." 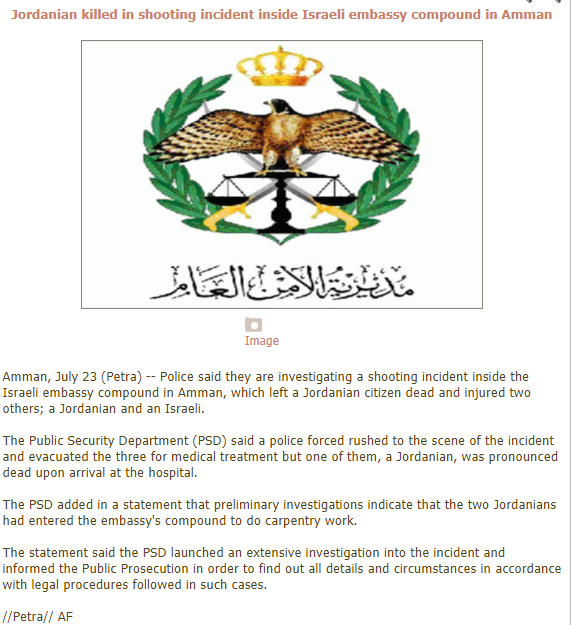 No word on why the Jordanian was killed. 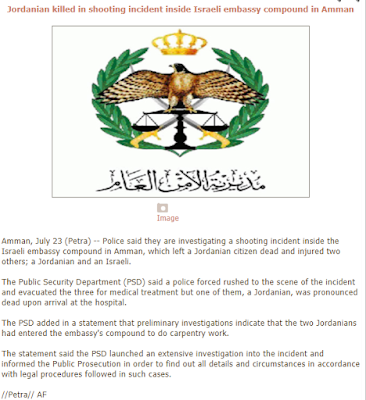 And Jordan is at peace with Israel all the while inciting over the issue of Temple Mount security. “In the name of the Palestinian leadership, I declare the suspension of all contacts with the occupying country on all levels until Israel revokes all its measures against our Palestinian people and Jerusalem, particularly at Al-Aqsa Mosque, and preserve the historic status quo at Al-Aqsa Mosque...We also reject the so-called electronic gates because they are a political move hiding under the cover of an imaginary security pretext that aims to control Al-Aqsa Mosque and evade the peace process as well as turn the conflict from a political one to a religious conflict,” he added. and hope you all are astounded at his other claim, of "an imaginary security pretext". 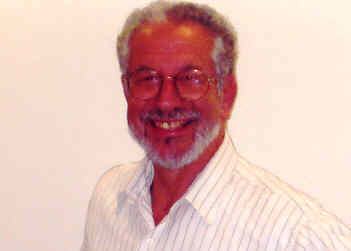 David Weinberg picked up the theme of 'What status quo?' already and my long-time readers well know that I have noted the ludicrousness of that so-called status quo. Two new mosques have been constructed at the Temple Mount since 1967 and a third is under construction at the site of the Barclay Gate. The visiting times for non-Muslims have been altered. The area in which non-Muslims can visit were changed. And that "historic" qualifier is from 1967. The previous claims of a status quo actually related to Jewish rights of prayer at the Western Wall! The status quo at the Patriarchs' Cave in Hebron, that no Jews be permitted not only inside but to ascend higher than the 7th step outside no longer exists. Abbas expects us to suspend our beliefs as regards history and tradition. Momani: Aqsa cameras to connect all Muslims with holy shrine Installing cameras at the Al-Aqsa Mosque/Al-Haram al-Sharif will enable 1.7 billion Muslims across the globe to remain in touch with the holy shrine and those taking care of it, State Minister of Media Affairs, Muhammad Momani, said on Wednesday. 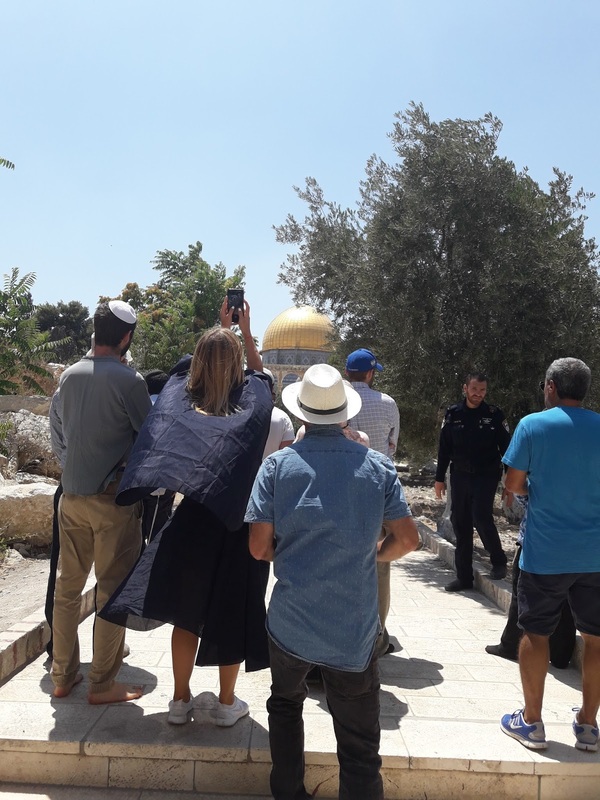 The minister, who is also government spokesman, said the cameras will put an end to violations by extremist Israeli settlers, explaining that they will not be installed at praying places at the holy shrine. 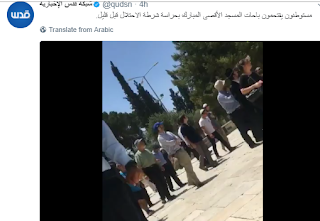 This is a clear evidence that the cameras are meant to monitor moves by extremist Jews and not to monitor Muslim worshippers, he explained. Momani added that the installation of the cameras will refute Israeli claims that "Palestinian rioting" is to blame for their provocations and violations against the holy shrine by Israeli police and extremists. The minister emphasized that the cameras and the footage they will provide will help Jordan document Israeli violations and pursue legal action at international arenas. 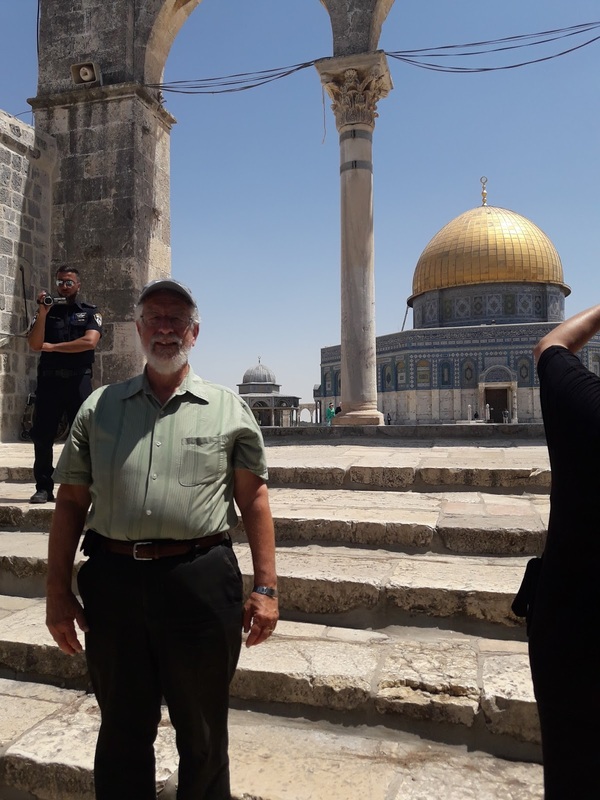 He noted that Israeli right-wing groups oppose the installation of cameras at the holy shrine because this measure will strengthen the Jordanian presence at the holy site. 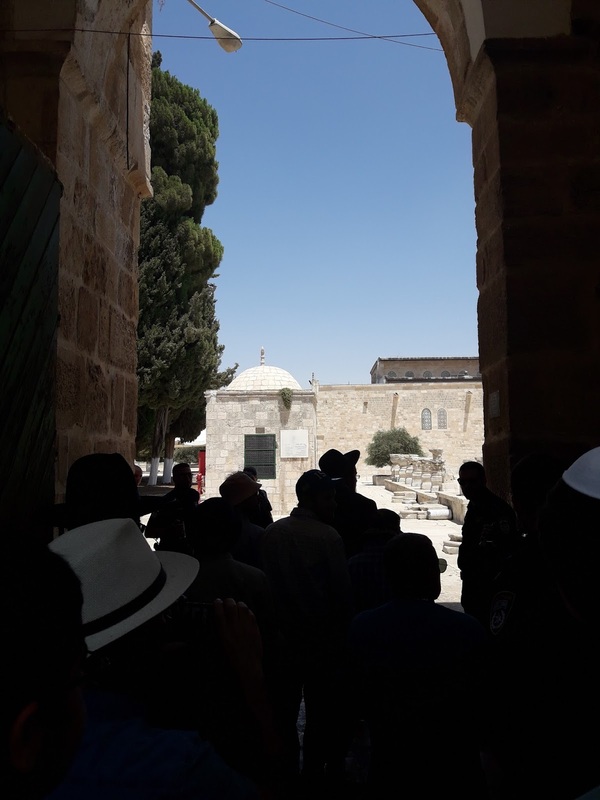 Jordan rejects Israel's move to install surveillance cameras at the Al Aqsa Mosque in occupied Jerusalem to monitor Waqf and Hashemite reconstruction workers and Muslim worshippers, Minister of State for Media Affairs and official government spokesman Mohammad Momani said on Tuesday. "Jordan strongly dismisses the presence of a police station inside the holy Al Aqsa compound and deems it as a flagrant military assault against the freedom of worship and an interference in the affairs of the Jordanian Islamic Waqf, which has the jurisdiction and the mandate to maintain security and ensure the safety of worshippers and tourists inside the compound," he said. Momani called on the occupation authority to remove all military manifestations from the Haram Al Sharif compound, including the police post and the cameras, which were put up last week, and all other cameras installed at the Bab al Magharebah Gate in 2011 to monitor movement into and out of the compound. 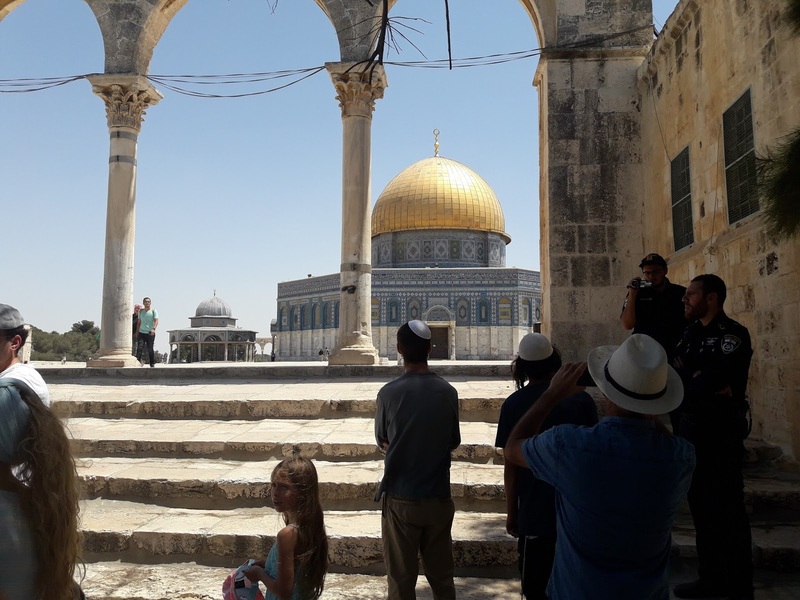 Minister of Awaqaf and Islamic Affairs Hayel Daoud said that surveillance cameras will be installed at Al Aqsa Mosque/ Al Haram Al Sharif in the coming few days. The minister said in a statement that the Jerusalem Awqaf Department, affiliated with the Awqaf Ministry, will be in charge of the cameras, which will cover an area of 144 dunums through a control room...The minister denied allegations that the cameras will be used against "Al Murabitun", adding that these cameras will be used to protect Jerusalem and Jerusalemites. That was on March 20, 2016. Prime Minister Abdullah Ensour said that Jordan has always been, and will remain the staunchest supporter and defender of Palestine, its people and cause as well as its holy shrines. 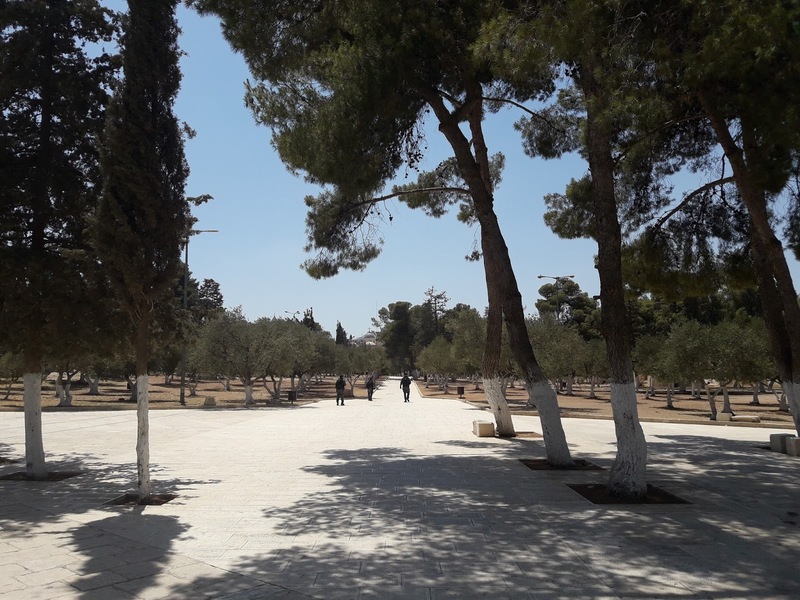 "However, we were surprised since our intention to carry out the project, by the response of some of our Palestinian brethren to the project, adding that they voiced their concern and cast doubt on its aims and objectives. "As we respect the points of views of our brethren in Palestine in general and in Jerusalem in particular, and because we always affirm our full support to the Palestinians and their aspirations at all times, we found that this project is a point of contentious and therefore, we decided to halt its implementation. 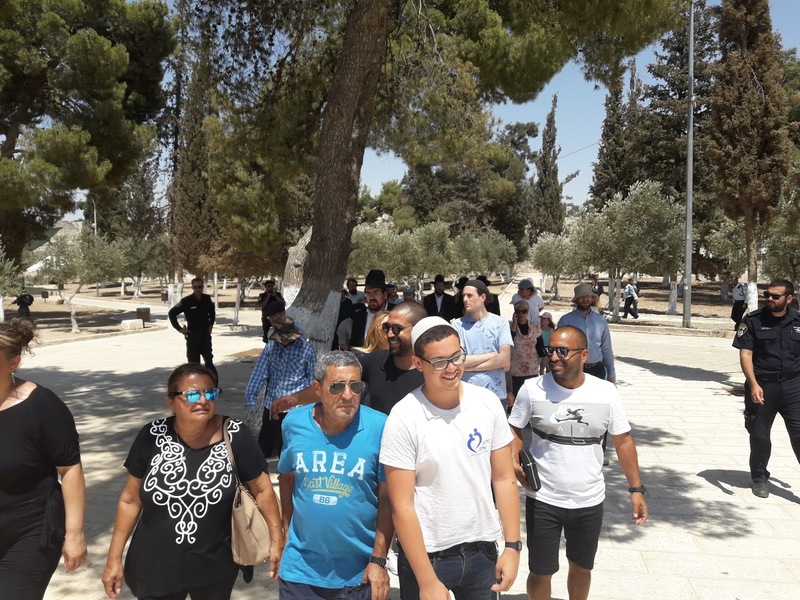 At Which Holy Site Was That Violence? Violence at a holy site that once was a Jewish Temple and now a Mosque. Violence at a holy site that is a church, recalling a previous attack at a church*, that once was a church, then became, after the Muslim conquest, a mosque and now for several centuries is a cathedral. 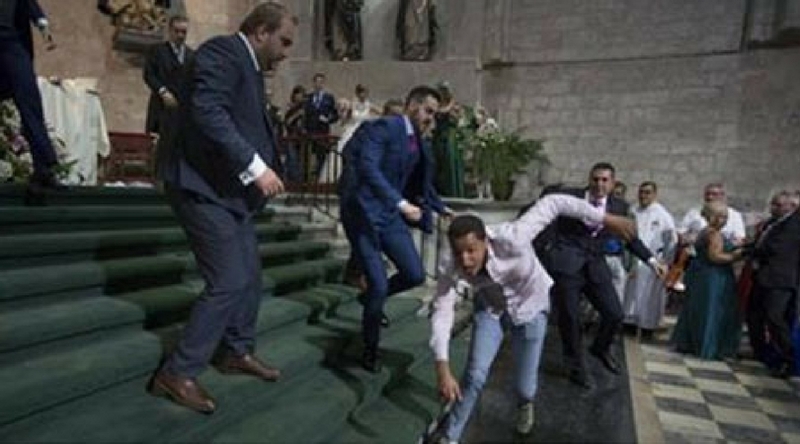 VALLADOLID, Spain - A Muslim man stormed the San Pablo Church in Valladolid, Spain Saturday evening [video here] and disrupted a wedding while shouting "Allahu Akbar!" The 22-year-old unnamed Moroccan charged the altar and tore off the altar cloth as the groomsmen tried to grab him. Witnesses said the man tried to assault the priest. "A lot of people, including the bride's mother, were crying," according to the priest who was officiating the wedding, "and there were people who had already jumped out of the pews because we did not know whether this person came alone or not or if he was armed." 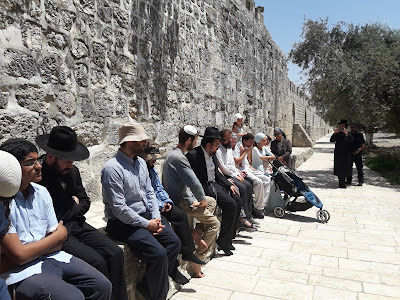 And they get upset if Jews request the right of access and freedom of worship at the Temple Mount. A confrontation between Muslim tourists and guards employed by the Roman Catholic bishop at the world-famous Cordoba mosque saw two people arrested and two guards injured last night. Trouble broke out when the visitors knelt to pray in the building, a former mosque turned into a Christian cathedral in the 13th century, where a local bishop, Demetrio Fernández, recently insisted that a ban on Muslim prayers must remain.Half a dozen members of a group of more than 100 Muslims from Austria had started praying among the marble columns and coloured arches of the vast building when security guards ordered them to stop. "They provoked in a pre-planned fashion what was a deplorable episode of violence," the bishop's office said in a statement. Cathedral authorities said the guards had invited the visitors to continue viewing the inside of a 24,000 sq metre building that was once the world's second biggest mosque, but without praying. "They replied by attacking the security guards, two of whom suffered serious injuries," the bishop's office said. Here are excerpts from the full text of the memorandum on the Western Wall issue addressed by Col. Frederick H. Kisch, political representative of the Jerusalem Zionist Executive, for the President of the Zionist Organization to the Secretary General of the League of Nations for consideration by the Permanent Mandates Commission which represented the appeal of the Jewish people to the nations of the world for the full protections of the full protection of their right to their Holy Places in the land of their fathers, demands that the Mandates Commission take immediate steps to find a solution to the problem. “On behalf of the Executive of the Zionist Organization, which is recognized as the Jewish Agency for Palestine in Article 4 for the Palestine Mandate, I have the honor to request that this petition may be transmitted through the proper channels to the Secretary General of the League of Nations for the information of the Permanent Mandates Commission. “2. The petition relates to a deplorable incident which recently occurred in Jerusalem on the Jewish Day of Atonement, which has caused the most painful impression throughout the Jewish world. “About 9 a. m on the Jewish Day of Atonement, falling on September 24, 1928, British police, acting on orders received from the Deputy District Commissioner of Jerusalem, broke through the crowded worshippers at the Kothel-Maaravi, generally known as the Wailing Wall, and effected the removal of portable screen which had been set up the previous evening. The screen separated men and women at worship, in accordance with the traditional Jewish religious rite, but did not interfere with the right of way...In carrying out the order to remove the screen, the police thrust aside, and, as was perhaps inevitable for the execution of the order, knocked down several aged worshippers, men and women. One worshipper holding on to the screen was dragged along the ground. “The identical screen had been in use in the same position ten days previously on the Feast of the Jewish New Year, without any complaint or protest having been communicated to any Jewish authority. “3. The Government of Palestine in an official communique have justified the action taken, on the grounds that the screen and its attachment to the pavement constituted an infraction of the status quo which the Government was unable to permit, and that the beadle in charge of the arrangements for the conduct of the Services at the Wall had been instructed, on the eve of the Day of Atonement, that the screen would have to be removed before the Services on the following day. “6. In order that the Permanent Mandates Commission may appreviate what such an incident means to the Jewish people it is necessary to explain that the Day of Atonement is the most sacred day of the Jewish calendar. The Shmonch Esrei prayer during which the incident occurred and the police broke in among the worshippers, is the most important prayer of the whole day of worship. The Kothel-Maaravi has ever been the most holy spot for the Jewish nation since the destruction of the Temple. “7. On the other hand, the Jewish place of prayer at the Wall is not holy to any other nation or community, and while the Jews have for generations past undertaken the most arduous journeys in order to be able to pray at the Wall if only for a few moments, the Moslem neighbors have never used the site for prayer, and have not hesitated to desecrate it in the most offensive manner. The Executive wish emphatically to repudiate as false and libelous the rumors which have been circulated that it is the intention of the Jewish people to menace the inviolability of the Moslem Holy Place which encloses the Mosque of Aksa and the Mosque of Omar. “8. The demand of the Jewish people is that they shall be given freedom to pray according to their religious rites without external interference. The land in front of the Wall is a place of prayer for Jews, and an end must be put to a situation under which an institution belonging to another community, in this case the Moslem Supreme Council, can interfere with the manner in which the Jews arrange their religious Services at their most Holy Place. “10. The situation thus explained is painful and humiliating to the whole Jewish world, and the Executive venture to think that it is unworthy both of the League of Nations and of the Mandatory Power, under whose joint auspices the administration of Palestine is conducted. “11. The Jewish people have always been anxious to secure for themselves proper conditions for free and undisturbed worship at the Kothel-Maaravi by direct arrangement with the Moslem authorities, with fair compensation for any proprietary rights affected. The Executive submit that the provision of such conditions for Jewish worship at the most sacred place of prayer for all Jewry, is an essential condition of civilized government in Palestine. That real freedom of worship is impossible under existing conditions is demonstrated by reason and confirmed by experience. The Executive therefore submit that the Mandatory Government should take all necessary steps to ensure that an arrangement eliminating the present obstacles to the free exercise of worship at this Holy Place shall be effected within the very near future. I ascended today, at 1:30 PM with a group of about 34 other persons. Haredi. Chardal. Mizrachi. Secular. Family from America. Olim. After security, identification check and a short lecture on proper behavior, off we went. We were there for some 40 minutes or so. The police were courteous but firm and there was tension. But we visited the Temple Mount. Remember the Surveillance Camera Fiasco? A 'New Settlement'? "New"? Really? Remember When Gaza Was a 'Concentration Camp'?